TAP Portugal has dropped the price of their June 2017 flights from Toronto to Lisbon, Portugal down to $485 CAD roundtrip including taxes. Yes, TAP Portugal is back in Toronto. It's a pretty new route for them (well, new, again). They launched a few weeks ago. "The service will bring TAP back to Toronto for the first time since 1994." June is a great month to visit Portugal, with highs of around 25C, before the scorching heat of July and August. June 15 to June 23, 24, 28, or 30 are currently the cheapest date combinations. If you click on 'More' on the Skyscanner search results, you can also click through directly to the TAP Portugal website for booking, for $27 more. 4. Click on 'Select' to show the phone number to call (1-800-755-4580). These 'phone only' offers are something new from FlightHub, so I'm not sure how well it works. If you try it out, please let me know about your experience. 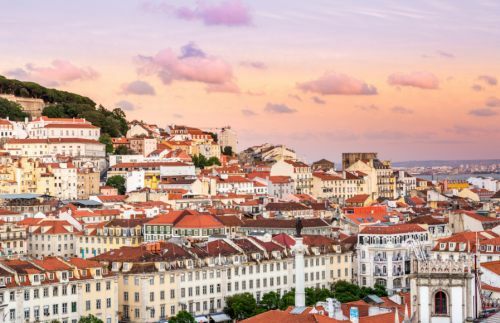 Update 12/21 - TAP Portugal has now dropped the price of some of their November and December 2017 non-stop flights from Toronto to Lisbon, Portugal (LIS) down to $425 CAD roundtrip including taxes. The average high for Lisbon in November is 18C. With FlightHub, you need to call to get the deal, just like last time. From what I heard, this worked really well. Update 2/14 - Non-stop flights in November and December 2017 from Toronto to Lisbon, Portugal (LIS) are available again today for $509 CAD roundtrip including taxes. Flights to Faro, Portugal (FAO) are available for $30 more. toronto, yyz, flight deals, europe, western europe, lisbon, portugal, lis, southern europe and tap portugal. 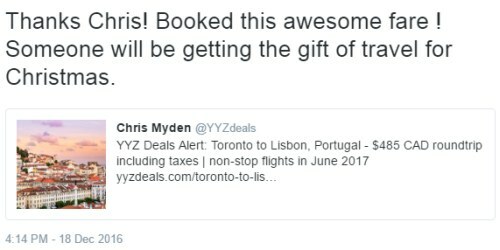 12 Responses to "Toronto to Lisbon, Portugal - $425 to $485 CAD roundtrip including taxes | non-stop flights in June 2017 (and now November/December)"
Have a great time in Portugal Kyle and Gursheel! Gursheel: Thanks for the info, much appreciated. Glad to hear it was painless. Thanks for the alert on the flight deal! So I called Flight Hub directly and booked my flight, that way I saved over about $100. The experience was excellent, very very smooth, very efficient. I told the agent the flight and price I was looking at and then it was a simple matter of confirming availability and providing my contact and payment details. The ticket and confirmation emailed to me instantly. Yaaas! we score that amazing price :D Europe here we come!! Can't find this price anymore. Any one else have luck? Looks like the 425 deal is gone. Best I could get is 602…Anyone else? No problem Galyna. Have a great time in Portugal! Thank you, Chris! This is an amazing deal! We booked our flights on the evening of Dec 15 and managed to get a great deal! Our flight was $513 CAD with taxes included. We booked it directly through the TAP website. Can't go wrong with a deal like this especially since it is a direct flight! Thank you so much for everything! No problem Nicole! Have fun in Portugal!